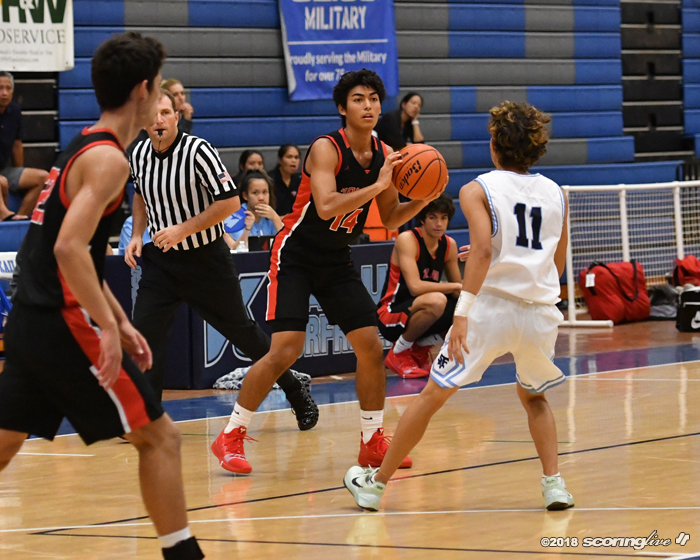 KAILUA — Iolani pulled away early then held off an undermanned Saint Francis team, 53-37, to claim the 7th Annual Surfriders Holiday Classic Saturday night. 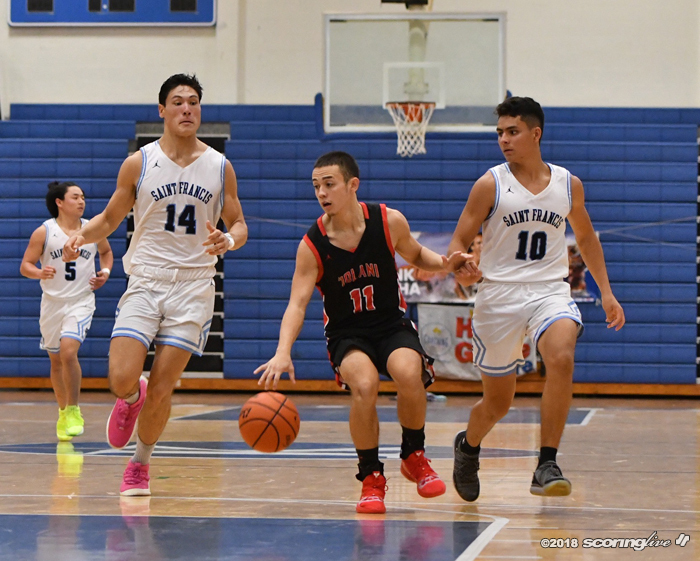 Frank Felix scored 11 of his game-high 17 points before halftime to lead the Raiders (3-0) to their third win in as many nights before a crowd of about 300 fans at Kailua High School. 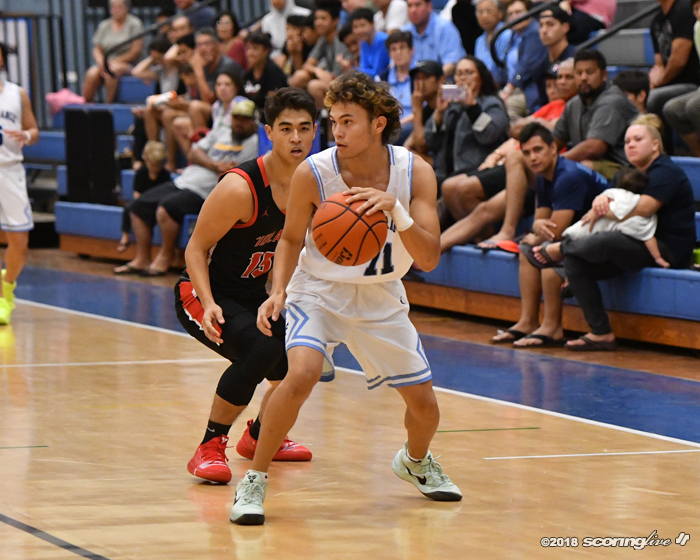 The two-time defending Division II state champion Saints (4-2) played without their top player in Kameron Ng. 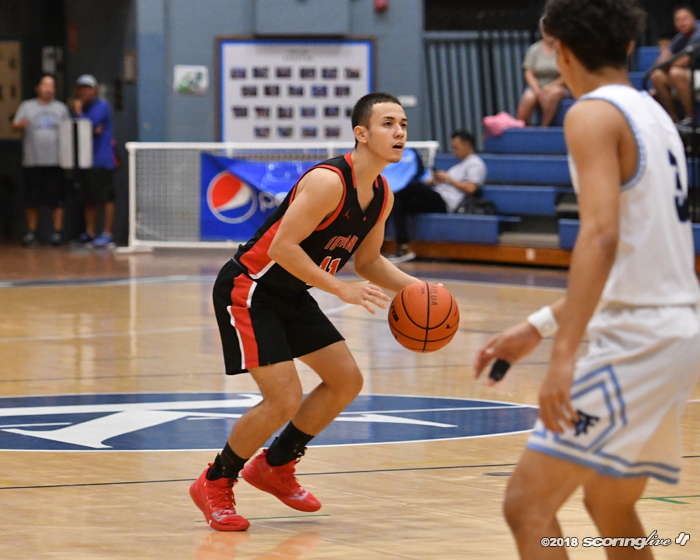 The senior guard, who is averaging 25.2 points per game this preseason, did not play after sustaining a lower leg injury while attempting to draw a charge late in the first half of Friday night's double-overtime semifinal win over Kailua. "It's nice to come away with three wins. 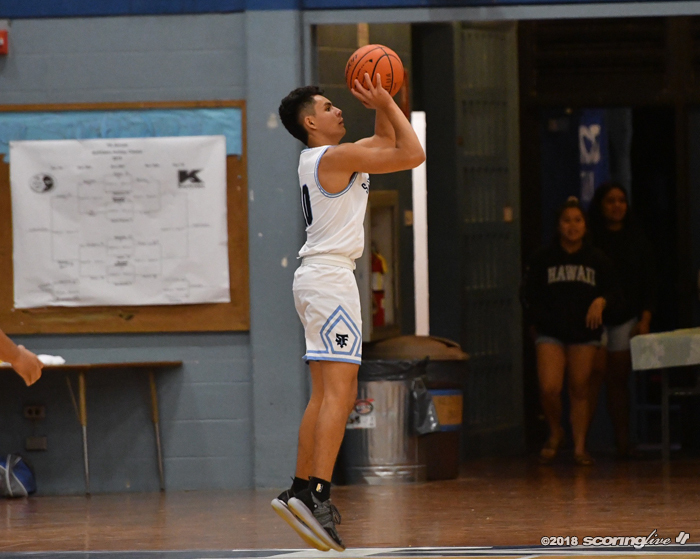 I mean, I know the teams that we played didn't have all their guys: Waipahu still didn't get their football guys yet, (Roosevelt's) Visoria got hurt on the second play — who's probably one of the top guards in the state — and obviously, Kam wasn't playing tonight and he's another one of the top scoring guards in the state, so while the three wins are good, we still looking to make progress," Iolani coach Dean Shimamoto said. 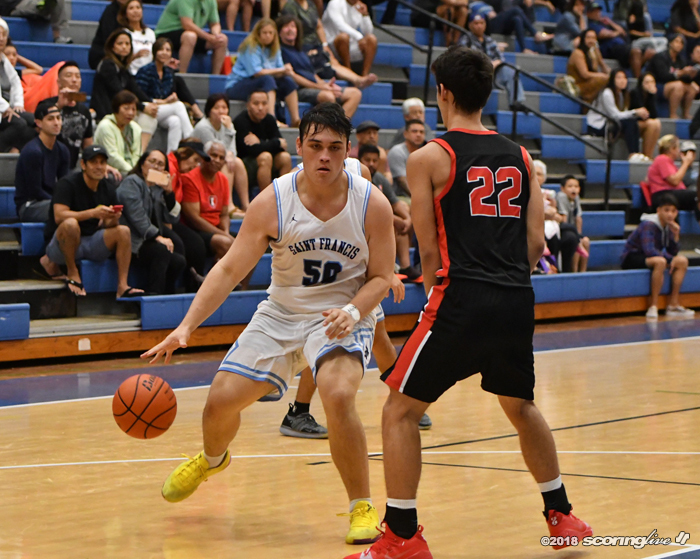 Without the services of the high-scoring Ng, Saint Francis struggled offensively, especially in the first half. It made just six field goals in the first 16 minutes, with only two of them falling in the second quarter. 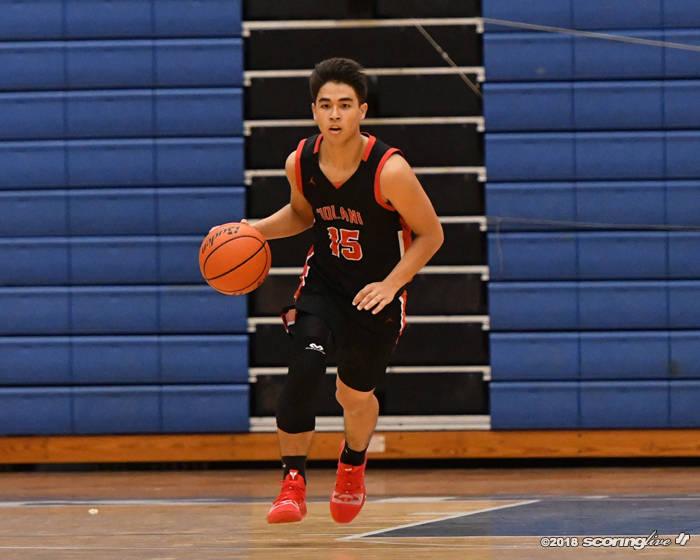 Meanwhile, Iolani shot the lights out early on. The Raiders hit four of their six 3-pointers in the opening quarter. Their final three possessions of the period were a pair of Felix treys from either corner sandwiched around a long ball from Kawika Lee from the left wing. 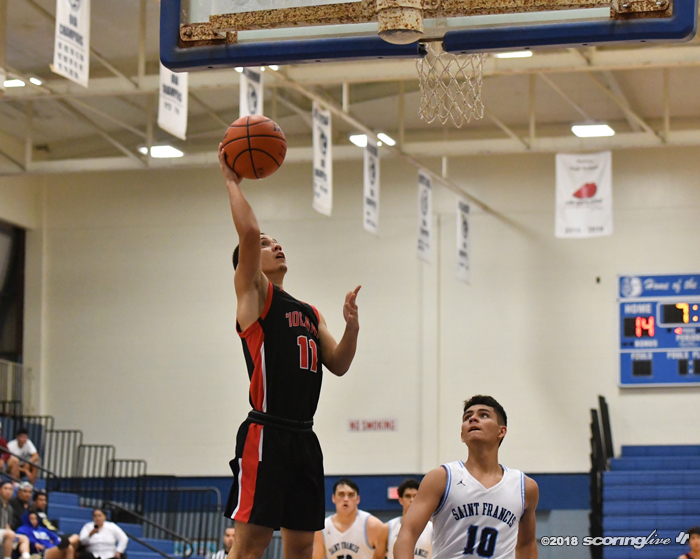 Felix drained another one from behind the arc before driving the lane and banking in a runner on back-to-back possessions to open the second quarter. 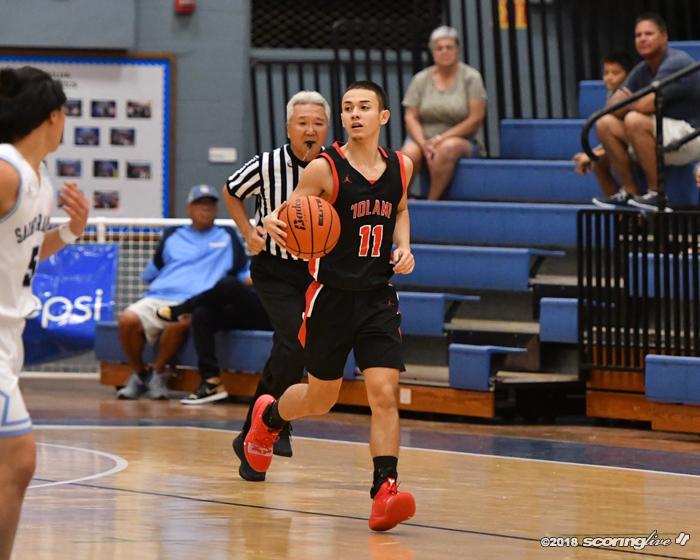 An offensive rebound and putback by Sam Wheeler about a minute late capped a 7-0 Iolani run and gave it a 23-9 lead. 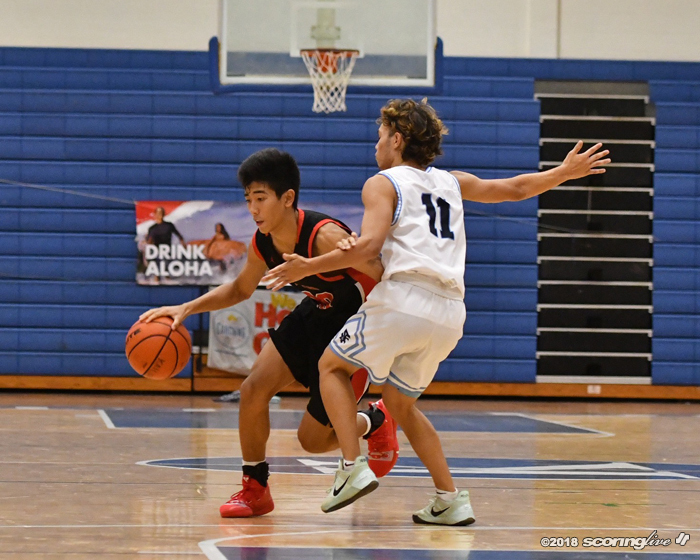 The Raiders grabbed 14 offensive rebounds, much to the delight of Shimamoto. 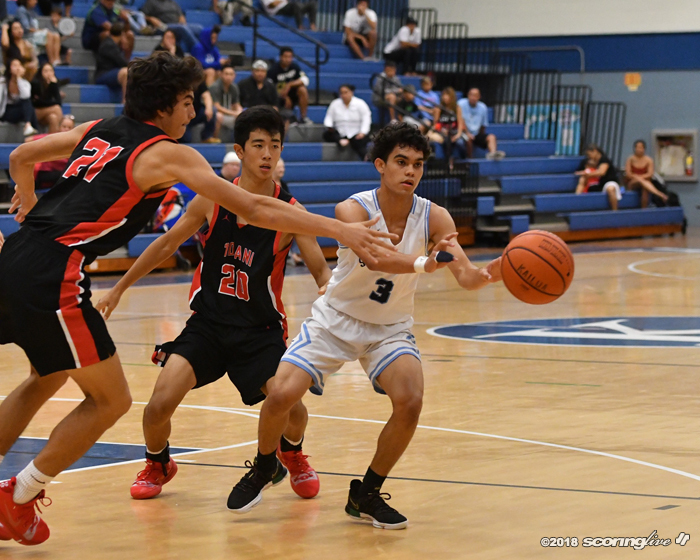 "We're generally undersized in most cases and we will be in most cases in the ILH, so to have our guys crash the boards like that and then come down with ‘em and give ourselves second opportunities is really great for us," Shimamoto said. 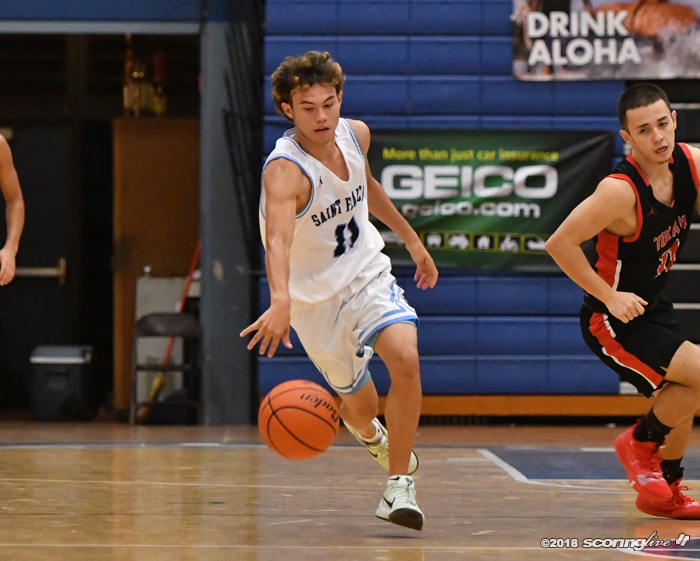 Noah Bumanglag got into the action and hit a 3-pointer from straight away with 1:38 left in the first half to make it a 28-12 advantage. The Raiders led at halftime, 28-14. 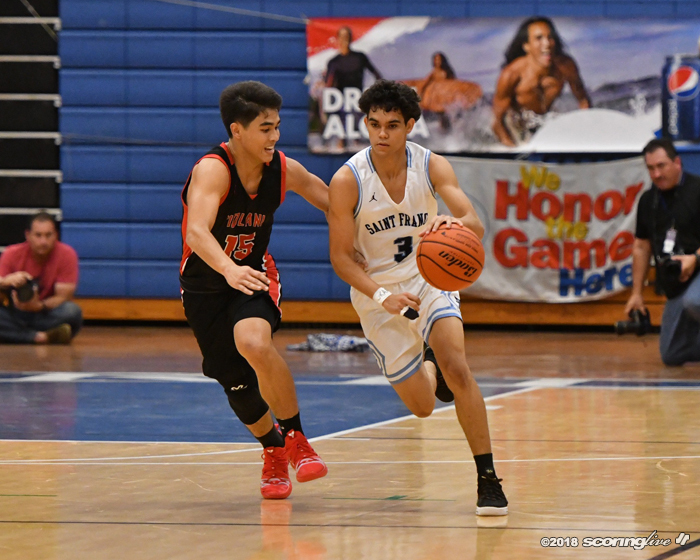 They opened the second half with an 8-0 run to take a 22-point lead — their largest of the night — but Saint Francis answered with a 9-2 run that was capped by Titus Liu's trio of free throws to cut it to 38-23 with 3:31 to play in the third. 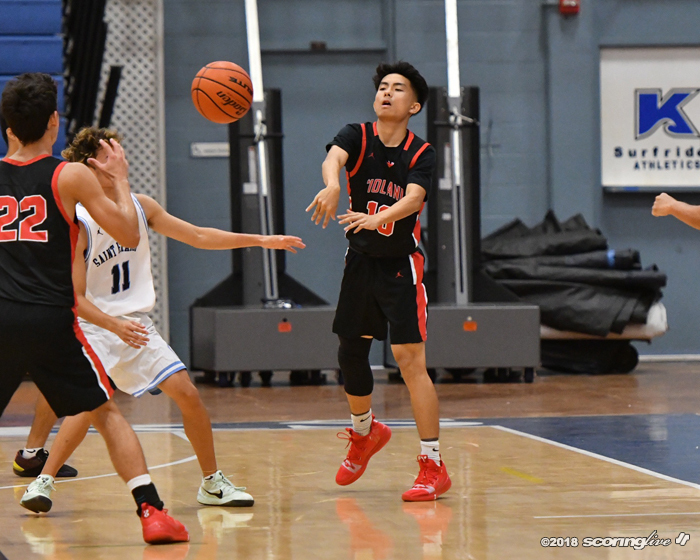 Iolani's lead was 43-28 after three quarters. 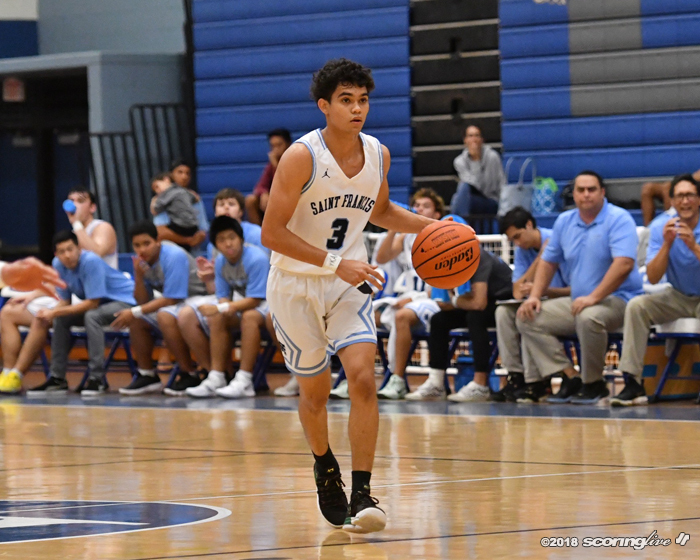 The Saints got within 45-35 on a Liu 3-pointer from the right win with 5:37 remaining and had a chance to cut it to a single-digit deficit after forcing a Raiders turnover, but Kordel Ng was called for an offensive foul and Jett Tanuvasa was whistled for an intentional foul. 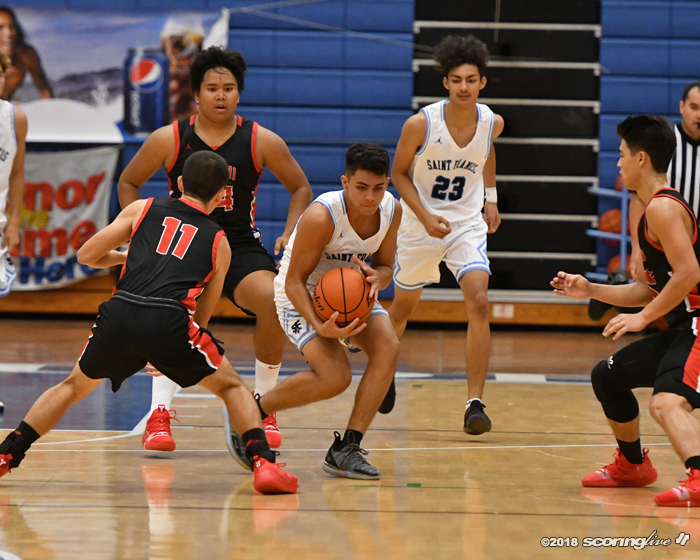 The result was two free throws — both of which Lee converted — and the ball for the Raiders, who led by a dozen at that point. 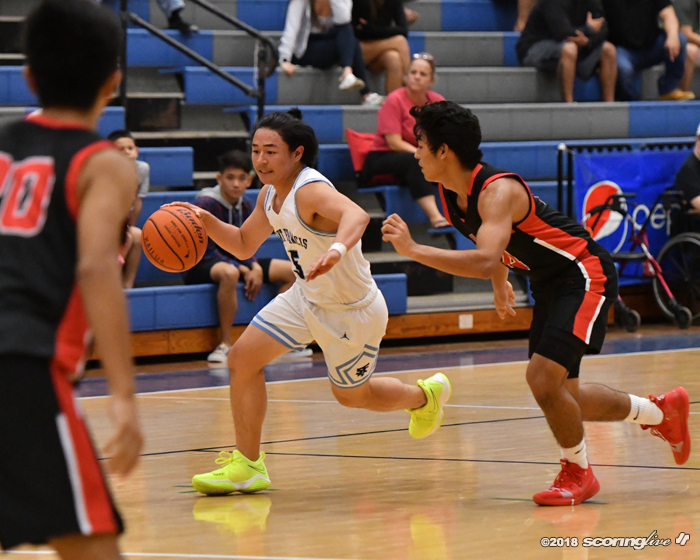 The Saints further dug themselves into a hole on their next trip down the floor when a technical foul was given to their bench in reaction to another offensive foul being called against Kordel Ng. 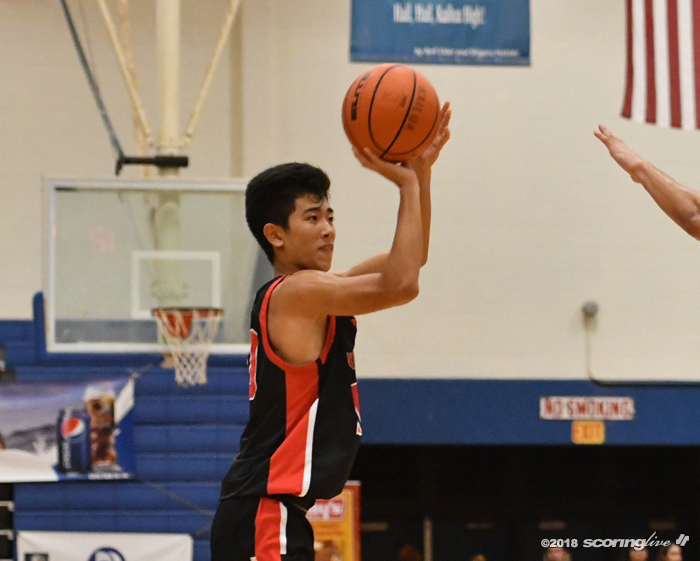 Lee made all four free throws and then Felix hit a 14-foot jumper to stretch it back to a 53-35 lead with 3:24 to play. 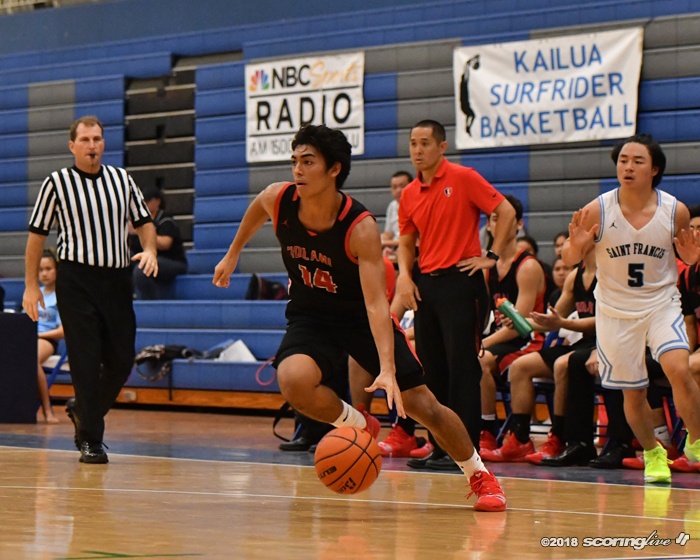 "We made it a 10-point game and then we had a technical that took us out of that and then we made some poor choices down the stretch," lamented Saint Francis coach Ron Durant, whose team shot 4 of 21 from 3-point range. "We've got a lot of work to do. 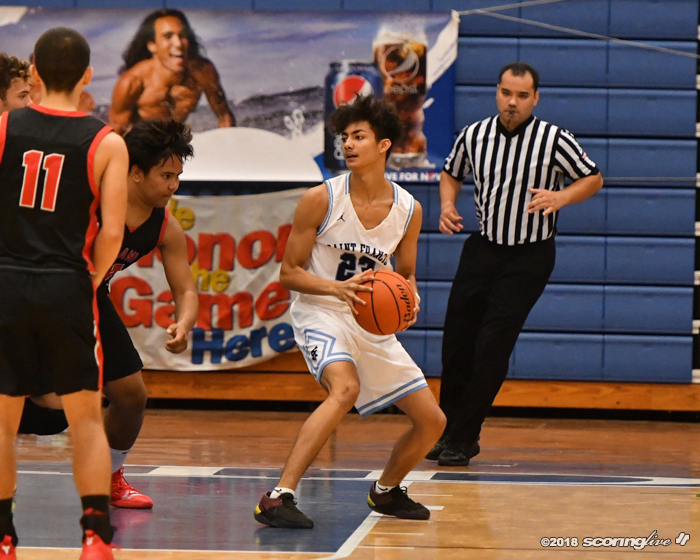 I think we gotta learn to control the tempo a little bit better, know when to shoot and when not to shoot. Right now our shot selection is just not very good," Durant added. 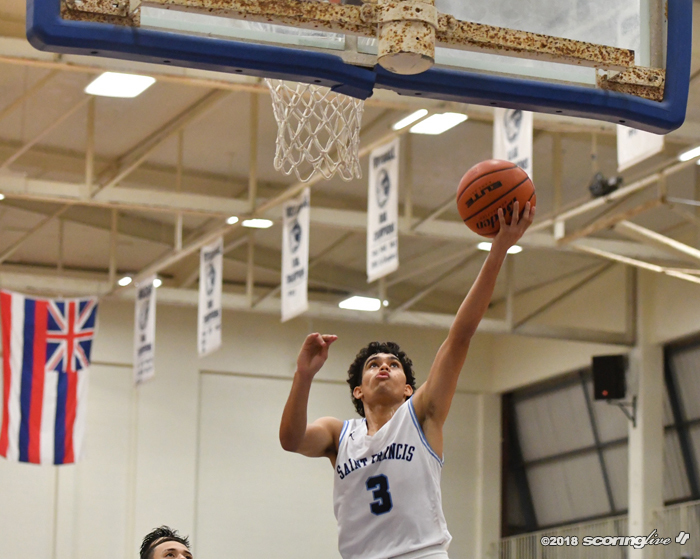 The Saints turned it over 11 times and shot a meager 7 of 17 (41.1 percent) from the free-throw line. 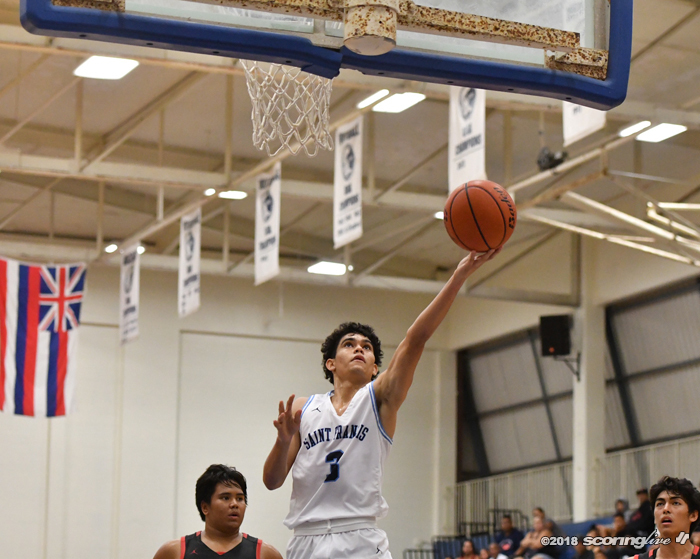 Kordel Ng was the lone player to score in double figures for Saint Francis with 13 points. 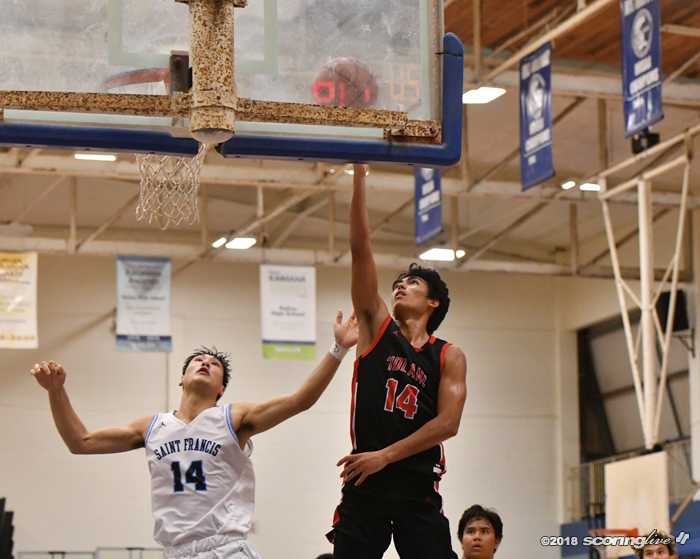 Bumanglag netted a total of 12 points, six in each half. 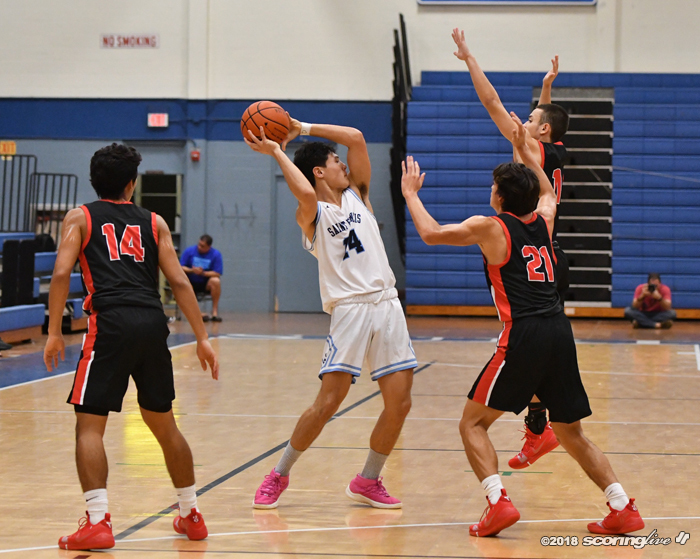 Lee was a perfect 8 for 8 at the line and finished with 11 points in the win. 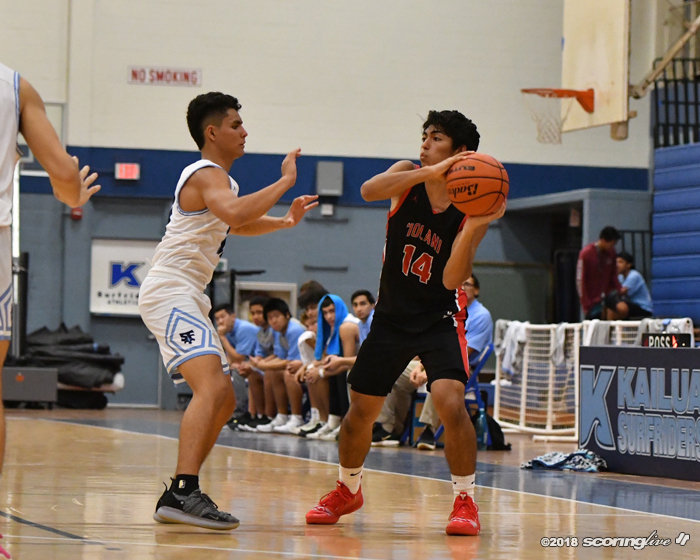 Durant was disappointed with the performance from his team, which is competing in Division I this season. "No silver lining to this one," he said. "I mean, we just didn't show up. There's no excuse for lack of effort and we didn't have any effort. We had no energy, no effort. I just thought we played selfishly, we didn't play as a team. 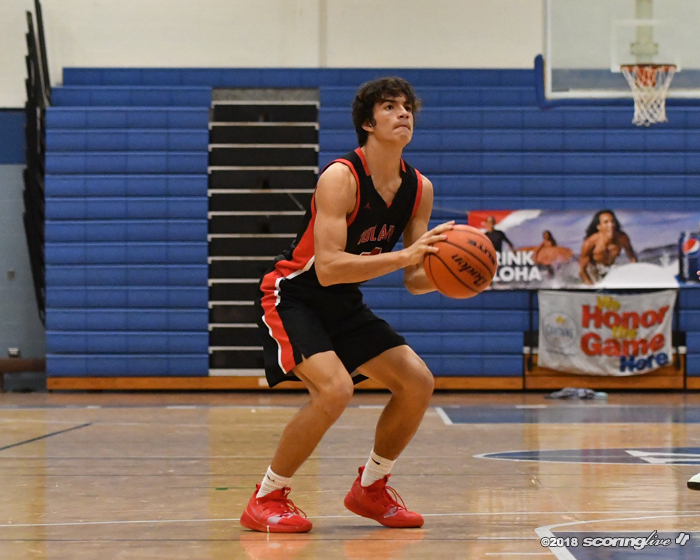 I'm not going to use fatigue as an excuse; Hustle is not an option." 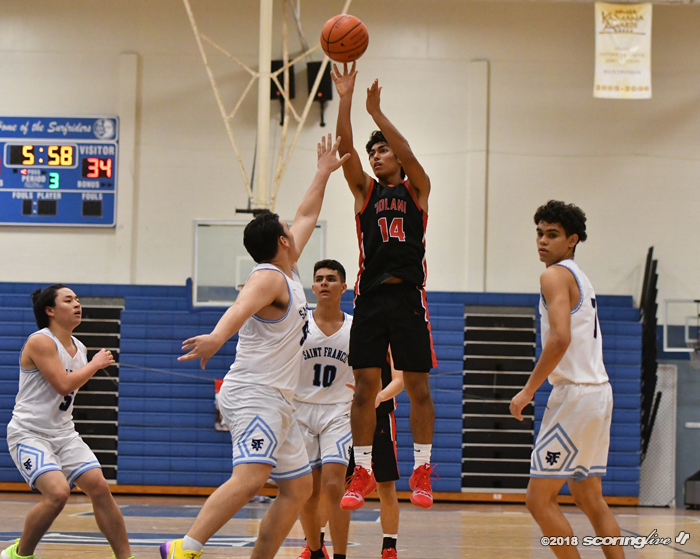 Saint Francis and Iolani will meet at least two more times this year during ILH regular season play. 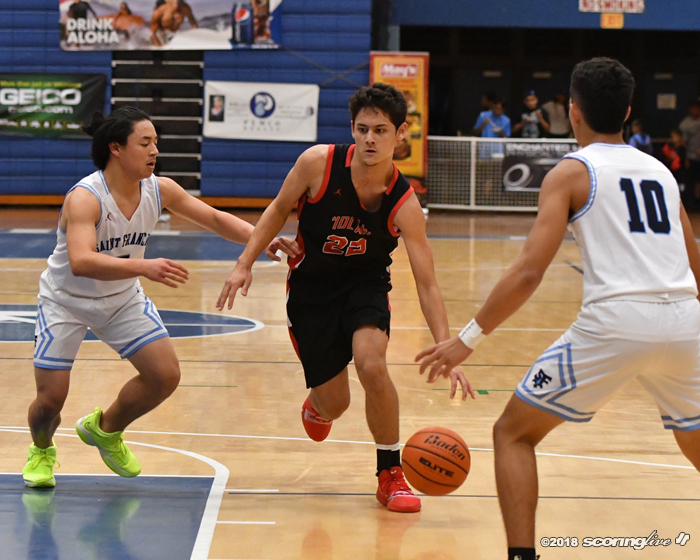 They play at Iolani on Jan. 17 and at Saint Francis nine days later. 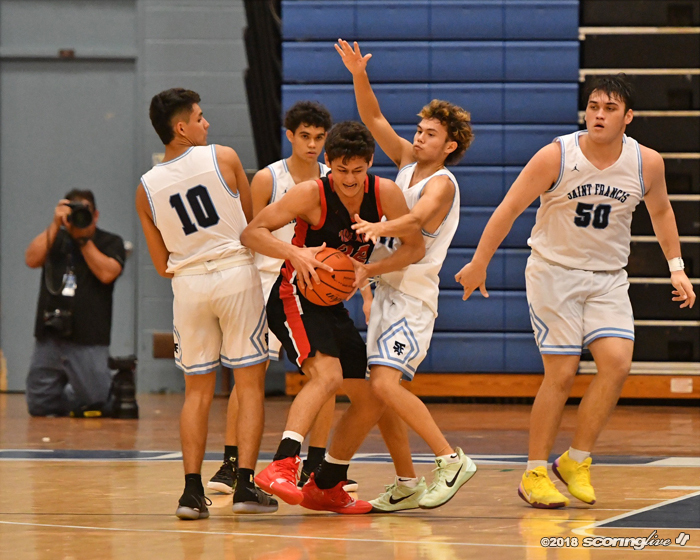 Both teams are taking part in the OIA-ILH Challenge next week. 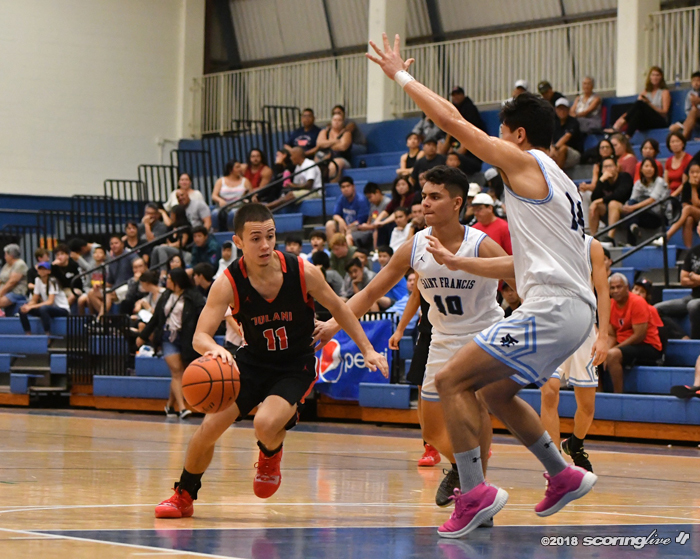 The Raiders open against Kalaheo, while the Saints face host Moanalua Thursday.